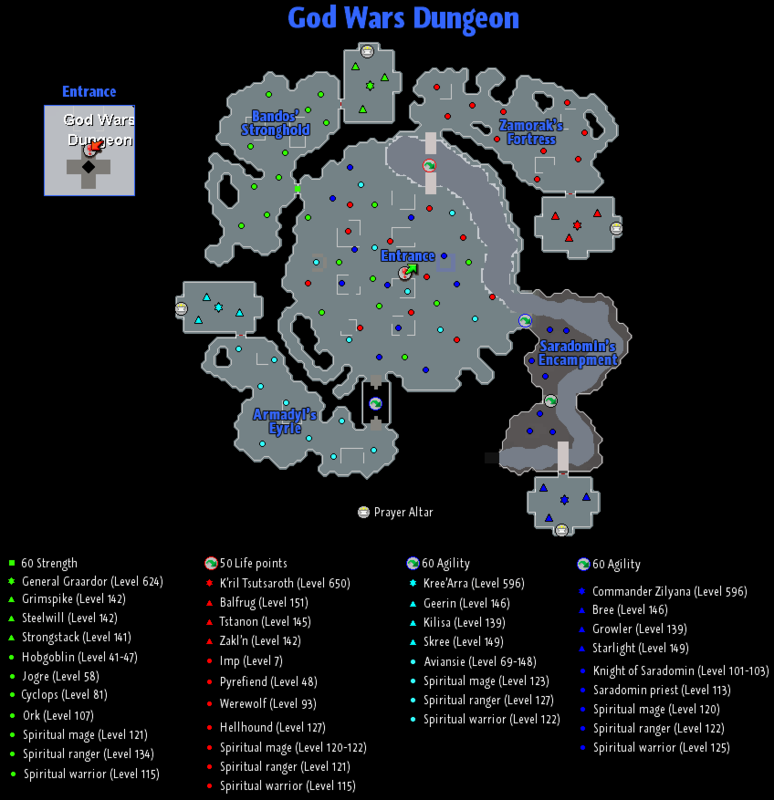 and welcome to the official God Wars Dungeon guide! During the third age before all players' time, the Gods fought one final war over the possession of a sword. You have probably heard in your travels that the scar of the war and the battles before it is the Wilderness. However, in a dungeon recently uncovered, the war wages on - and you and friends can attempt to plunder the weapon and much more! 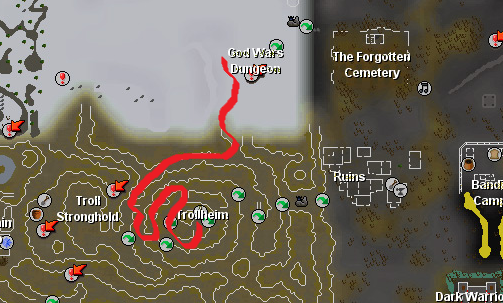 The God Wars Dungeon is just north of Trollheim and west to the wilderness. 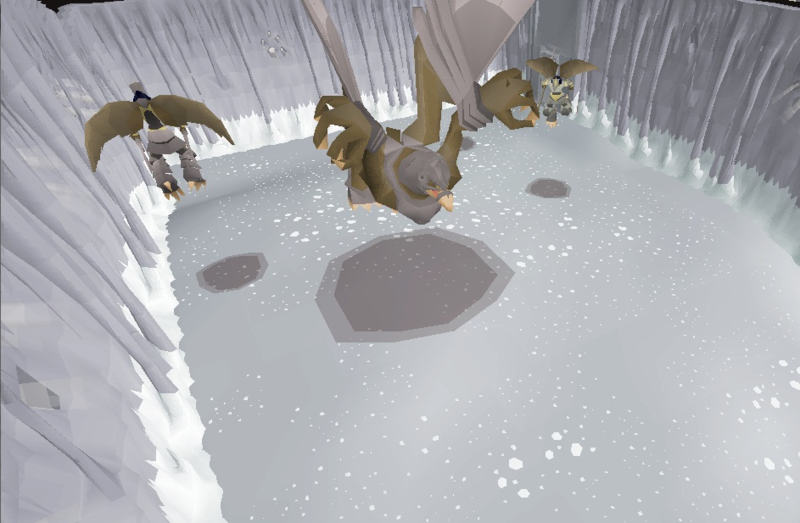 When you enter in the dungeon you will face monsters from each god's army (Armadyl, Zamorak, Bandos and Saradomin). They will attack you no matter what your combat is, because they are aggresive monsters! But there's a way to make them avoid you, if you wear a piece of armour which represents their god (i.e. Bandos Boots, Armadyl Chestplate, Saradomin Cape, Zamorak platelegs). If you wear a piece of each 4 gods, their army will fully avoid you! It's highly recommended to wear a piece of their god's armour, otherwise they will damage you badly. If you teleport away from the dungeon, all your killcount gained will be reset! To reach the dungeon, teleport to Trollheim (normal spellbook - 2 fire and 2 law runes) and walk all the way to the god wars entrance. 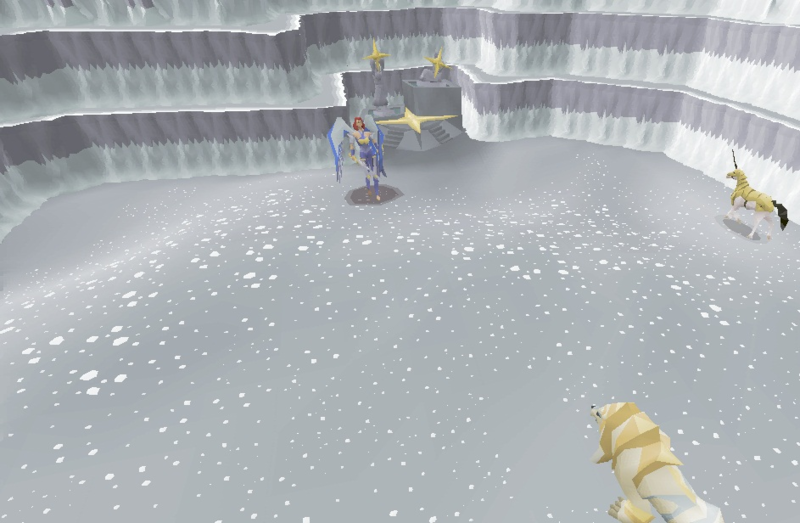 Please note that the entrance is guarded by ice wolfs, Melee Protect is recommended to avoid any HP loss. To obtain a godsword you need a godsword blade and a Hilt (Bandos, Armadyl, Zamorak, Saradomin). A godsword blade can be obtained by combining Shard 1, Shard 2 and Shard 3 using a hammer on an anvil (90 smithing required!). When you have the godsword blade, use it on the hilt to finish the godsword. In order to enter into the Bandos' Stronghold, you need a level of 60 in Strength and a Hammer. In order to enter into the Bandos Boss Chamber, General Graardor, you need 20 bandos killcount. In order to enter into the Armadyl's Eyrle, you need a level of 60 in Agility. In order to enter into the Armadyl Boss Chamber, Kree'arra, you need 20 armadyl killcount. 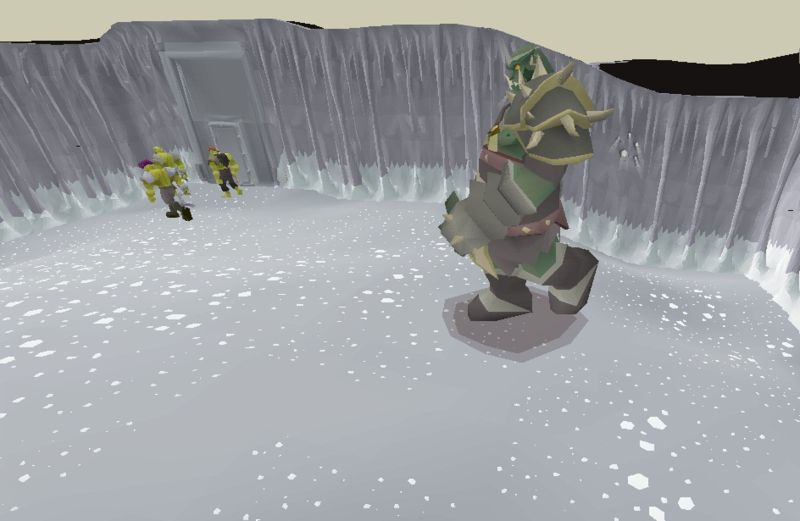 In order to enter into the Zamorak's Fortress, you need to have 50 Hitpoints restored to cross the bridge. 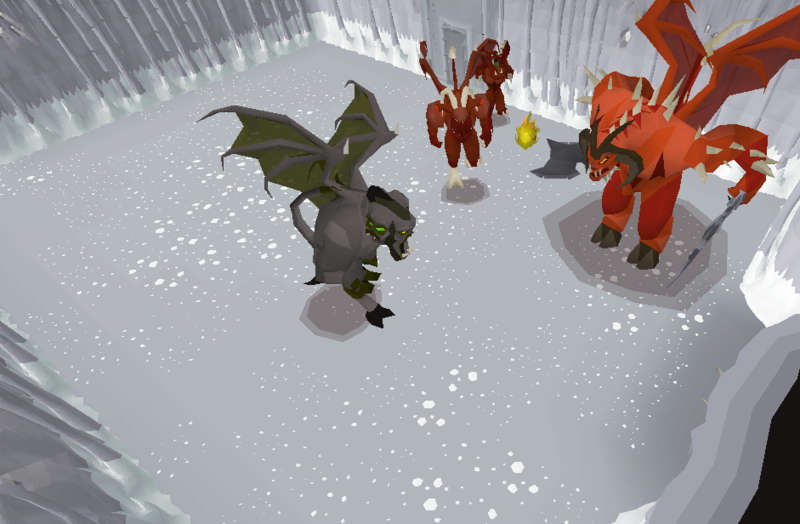 In order to enter into the Zamorak Boss Chamber, K'ril Tsusaroth, you need 20 zamorak killcount. In order to enter into the Saradomin's Encampment, you need a level of 60 in Agility. In order to enter into the Saradomin Boss Chamber, Commander Zilyana, you need 20 saradomin killcount. Please reply down with any missing or wrong information! Wow, that's what you call a really well written guide! Let us see you making more guides because really I enjoy reading your guides . 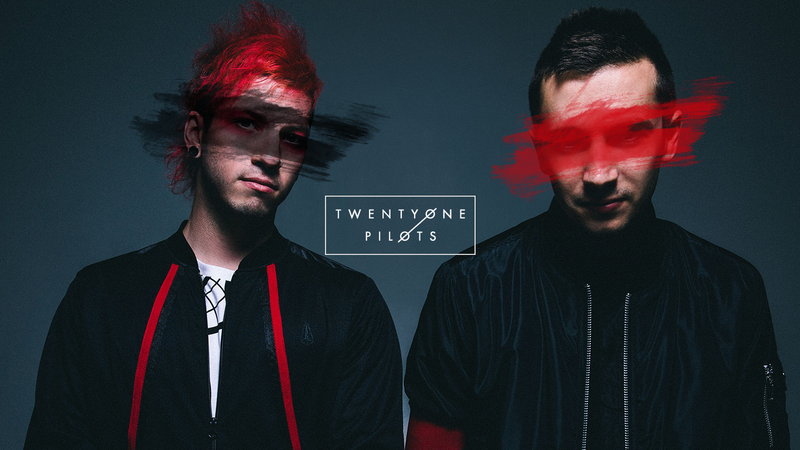 Very self explanatory, I love this guide because it is formatted very well and is very well written! Good job, George. Keep it up. Nice and (almost) complete guide as always I also like the lay-out a lot. I've really enjoyed reading this guide, It is will-written and proper. Thanks George it's the Best ! Good job George, excited while I was reading it! I have found something you should have added to your guide, when you have "all heights" in your more settings not ticked it won't show the entrance... 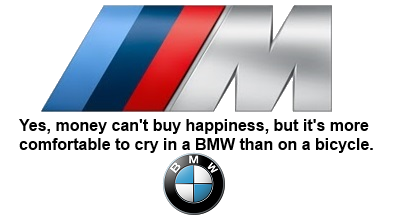 Here's a picture of what I mean, http://prntscr.com/4qa6a7. Nevertheless, really nice guide, keep up the good work!